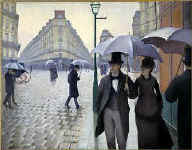 Gustave Caillebotte was an singular painter, whose paintings are identifiable at a glance. 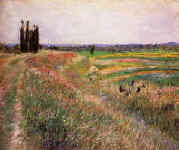 His compositions and the centring of his images were bold, his painting technique was often unconventional - a profoundly original work that was somewhat overshadowed by that of his own friends, and sometimes considered with irony by the critics of the time. 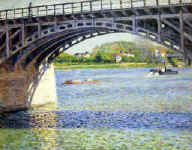 It's often thanks to the structure and the centring that Caillebotte's works are immediately recognised. Since the very beginning, Caillebotte specially liked the views from above (never from below, with the exception of some cliffs in Normandy). 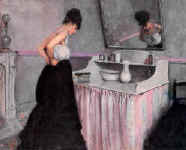 "Woman at a dressing table" is dated 1873 and is already a proof of this taste, a view with an uncommon angle with, in addition, a leaning mirror which creates an original and intriguing dialogue. The unachieved "Billiard" dated 1875 is seen under the same angle, but it's mainly the "Floor scrapers" dated the same year, and "Paris street, rainy day" dated two years later, that take full advantage of this trick. 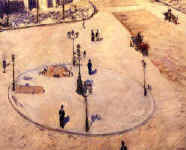 The critics didn't fail to mock the sliding impression that it provokes, but it is interesting to stress that the Dublin junction represented in "Paris street" is in the reality slightly sliding towards the point chosen by the painter, and that caracteristic Caillebotte fully succeeded to render. 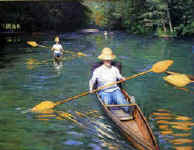 Later, once he had adopted the Impressionist technique, he didn't for all that abandon his plungeing way to observe the world. 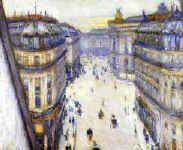 He would position himself on the higher floors to paint Haussmann Boulevard and Halevy Street, and the nearly vertical views of "Traffic island, Haussmann Boulevard" or "Boulevard seen from above". 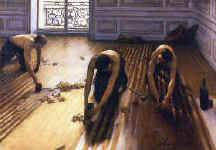 Another caracteristic of many Caillebotte's paintings is the translation of the effect called in the movie industry "subjective camera". 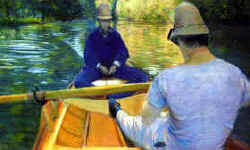 It is utilised in the scenes where the painter is part of the action, in a reduced space where no distance is possible. 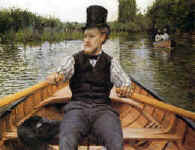 The spectator (the painter) is then seated facing the person represented in "Boaters", "Boating party" or in the pastel titled "Rowers on the Yerres River". The idea and the rendering of this effect were undoubtedly inspired and made possible by photography and by the availability of wide-angle lenses since 1860. Now it happens that Martial, Gustave's brother, was a fan of photography, and both brothers lived together at the time and were sharing many tastes and occupations. 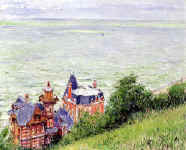 When he discovered the coast of Normandy with the Sail Club of Paris, Caillebotte continued to paint from high points of view, showing the coast and the villas in and around Trouville and Villers. 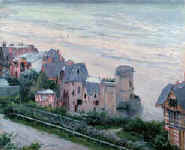 During his early period , the palette used by Caillebotte was sober and classical, close to that of Courbet ("Floor scrapers") or of Corot (landscapes from Yerres and around). It's only after 1877-78 that Caillebotte started to paint in a fashion close to the Impressionism, with a brighter palette and fragmented applications of colour, at least for the outdoors paintings - the portraits remaining altogether rather classical. 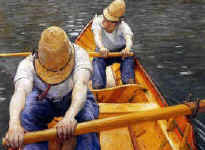 Another remarkable aspect of some paintings made during Caillebotte's Impressionist period is showing in the heavy thicknesses that can be noticed in some parts. 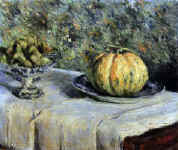 It is obvious that Caillebotte, when unsatisfied with his work, never scraped the paste like Manet used to do, but rather added layer upon layer. This is quite noticeable in the treatment of the water in the various "Skiffs" and on the diving board of the "Bathers", among others paintings. This characteristic adds even more force to the impact resulting from the original composition.